Ever wonder what it would be like being in the shoes of a chef…. Meet Chef Adam Kodovas. He has been in the Culinary Industry for over a few years now. 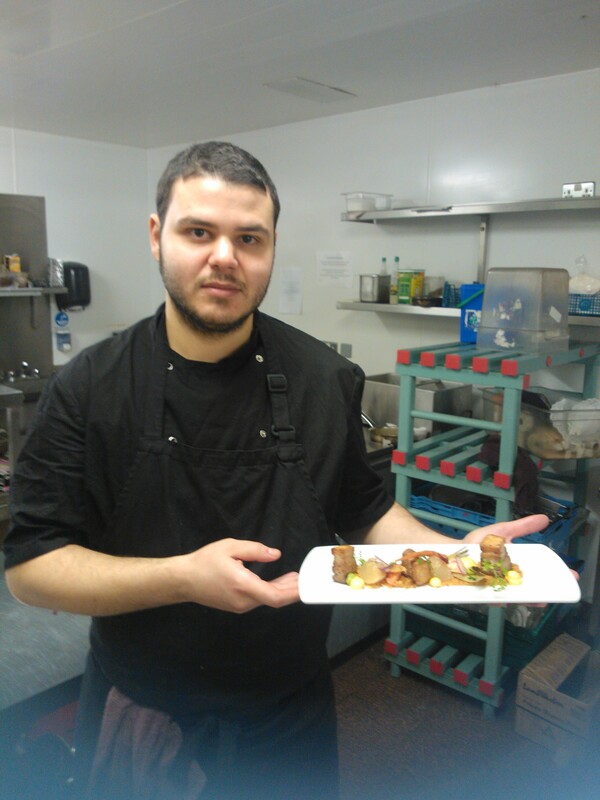 He attended Iek Domi, a Chef’s College in Athens, Greece and graduated in 2011. He then found his first job in the kitchen as an apprentice at giorti baxsevani. He has gained a ton of experience at some very well-known restaurants in Greece such as; 2mazi, Intersalas Catering, Royal Olympic Hotel, and the James Joyce Bar & Restaurant. Adam wanted to experience something different other than Mediterranean food, so he then found a unique Restaurant in Killarney, Ireland called Danu at the Brehon. Chef Adam was very happy and excited about this new adventure as he has never been to Ireland prior and he heard this was a great 4 star restaurant. Adam has now been working for Danu at the Brehon for over one year and he has gained such an extreme amount of knowledge from Head Chef Charlie Byrne. Now days you can find Adam in Killarney, cooking up a storm and finding new ways to come up with unique recipes. When I did this interview with Adam, I was very intrigued about how passionate he is being a chef. I have met a lot of chefs from around the globe, who are very passionate, but I can see that Adam has many dreams and goals that he would like to achieve. He is a very hard worker, he doesn’t give up, he continues to learn and take in the knowledge from other chefs around the world. I asked him to give me a quote of some sort that any chefs that are new in the industry can live by and this is what he told me, “Work hard, be patient and always have respect for what you are serving.” I agree Adam; you need to have respect for what you are serving and for everyone around you in the kitchen. Some hobbies and interesting facts about Adam, he has won two bronze medals in a cooking competition. He keeps going with his competitions in Ireland as well. I asked him well when you are not in the kitchen, then what are you doing. He laughed and said Kickboxing is one of his favorite hobbies. I want to Thank you Chef Adam Kodovos for letting me do an interview on you and you really inspire me and I am sure many chefs around the world to keep going and to strive hard to reach your dreams. Good luck to you in the future. If you are planning a trip to Killarney, Ireland why not make a visit to personally visit the restaurant that Chef Adam is at. Please click on the link below to read more about Danu at the Brehon. This is awesome! Great post. I enjoyed reading about this. and it has aided me out loads. I’m hoping to contribute & aid different users like its aided me.